Near the end of last year (just before Christmas), we announced that we were going to be doing something big for the users of Radiant WebTools in 2013. Specifically, we'd be launching a major new feature on the platform that allows each church on the system to have their own Apple or Android App. Well, today, I am extremely happy to announce that the new App feature is live! What many people don't appreciate is that mobile Apps are not cheap to develop. In fact, you'd probably be looking at a minimum of $5,000-$10,000 to have one custom developed for your ministry. With Radiant WebTools, you get one for free. 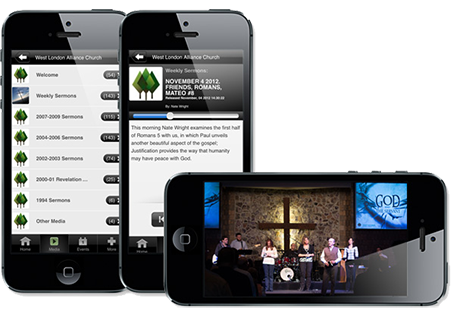 Our goal with Radiant WebTools is to provide a suite of digital tools that will allow churches and ministries to effectively communicate with their many audiences. The Church has the greatest story in the world to tell and websites, mobile sites, and mobile Apps are three primary communication methods in today's world. So we hope that you check out this new tool and make great use of it for the sake of the Gospel. To learn more, this page outlines the features and shares screenshots of the App experience.